A Hellenbach in GTA CW. The Vapid Hellenbach is a muscle car featured in Grand Theft Auto: Chinatown Wars. It is notable for its use as the official gang car of the Triads. The Hellenbach is a well performing, yet common vehicle. Available in a wide variety of colors, all models feature a hood scoop. 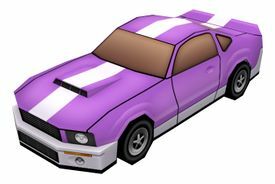 From the looks of the body, its muscle car style, and the papercraft, the vehicle resembles a present-day Shelby Mustang GT500. A "Triad" Hellenbach in the same game. The Triads use the vehicle as their official gang car during the events of Grand theft Auto: Chinatown Wars, with several modifications. 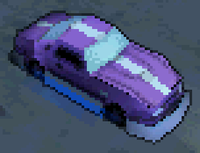 The Triad variant features a light purple/lavender paintjob, with a white stripe running the length of the vehicle, as well as blue neon underglow visible only at night. Prominent silver bumpers and sideskirts are also added, which can be seen clearly when viewing the vehicle at the auto merchant in BOABO. Top speed is also increased slightly, apparently as a result of a nitrous oxide modification (this can be heard during initial acceleration, which creates sounds similar to those of Grand Theft Auto IV's Sultan RS). This variant is frequently seen patrolling Triad territory in Algonquin and Broker, containing one or two Triad gangsters armed with Micro SMG's. The vehicle apparently replaces the Triad's custom Intruders and Ferocis seen in Grand Theft Auto IV, which takes place during the year before Chinatown Wars. 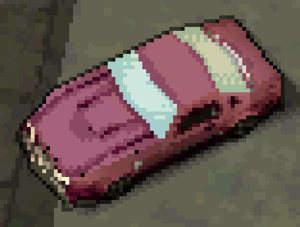 The Hellenbach was tweaked slightly in the PSP and iOS renditions of Chinatown Wars, such that all Hellenbach cars now feature a single white stripe running the length of the vehicle. The Hellenbach boasts impressive performance, with high speed and above average acceleration. It's cornering abilities are quite good and it can get around sharp turns easily. Its durability is slightly below the average, making it a poor choice for vehicular combat. The Triad variant is slightly faster than the standard model. The standard Hellenbach is a relatively common sight in traffic around Liberty City. The Triad variant is seen very frequently patrolling Triad territory in Dukes and Broker (centered around Cerveza Heights) and Algonquin (centered in Chinatown). A Triad Hellenbach also spawns in front of Zhou Ming's apartment in Steinway (even after the completion of his missions), and there are three spots around a shoreside Triad warehouse in Fishmarket North in which they may also appear, though it is uncommon for all 3 to appear at once. Stealing a Triad Hellenbach will provoke an armed response from the gang members inside, despite Huang Lee's membership in the gang. A papercraft model of the Triad Hellenbach, available for download on the Rockstar Games Social Club website. The Hellenbach plays the radio station Prairie Cartel by default when entered. Like the Hellenbach GT, the name is a play on the phrase "to hell and back", a phrase used to denote the extreme reliability of a vehicle by its owner. Under the "Chinatown Wars" section of the Rockstar Games Social Club website, members may download a printable papercraft model of the Triad variant of the Hellenbach. The papercraft also reveals that it is manufactured by Vapid. Hellenbach GT, another muscle car found in Grand Theft Auto: Liberty City Stories. This page was last modified on 18 August 2013, at 10:12.